I am developing a single cylinder open source scalable diesel engine (based on the Junker Jumo 205 motor) to be used in a multitude of projects. This engine can be used to power moving sculptures, micro cars, mopeds, generators, pumps or anything that needs a power source. The open source approach allows me to develop a quality engine for everyone to enjoy at a minimal cost. I attempted this project last year but I greatly miscalculated how much time my new born daughter would take! That being said, I now have some time available to dedicate to this project. I thought of this project about six years ago while looking for a small engine that I could run off bio-fuel. To my surprise there were no light weight, compact, multi-fuel diesel engines available at a reasonable price. The idea is to develop a low cost open source two stroke diesel engine that can run off a variety of fuels. The initial design will be for a 50cc engine with the intent of being able to eventually scale to 125cc and 250cc. Such a motor could be used to power mopeds, small farm equipment, well drilling machines, pumps, generators, etc. I have chosen the Junker Jumo engine design due to its piston configuration. On a standard diesel engine heavy cast iron cylinders and heads have to be manufactured in order to withstand the engine&apos;s compression. With the compression and fuel detonation taking place between two opposed pistons and in the center of the cylinder the walls can be thinner the further they are from the center of the cylinder. Both pistons will connect to the same crankshaft reducing the number of rotating parts. I have ran through about a dozen iterations in my head but up until now I haven&apos;t taken the time to model anything in CAD. I have uploaded a few images of my concept. Please keep in mind that this is a quick (30 hour) and dirty (interference, exact calculations, etc. have not been taken into account) model to show the design intent. There is a lot of high level mathematical calculations and FEA (Finite Element Analysis) that will need to be done and I hope to start on those in the weeks to come. Q: Why a two-stroke engine? A: Two stroke engines are less complex than four-stroke Engines, produce more power per unit volume per stroke and are less expensive to produce. Q: Aren&apos;t two-stroke engines bad for the environment? A: Yes, traditional two-stroke engines produce more exhaust emissions than their comparable four-stroke counterparts. This is due to the intake and exhaust ports being simultaneously open and the addition of oil to the fuel for lubrication. Q: How will this engine be better for the environment? A: Fuel injection and its opposed pistons design are the key here. Each piston works somewhat like a valve, by adjusting the position of the piston in the cylinder the intake and exhaust ports can be timed for efficiency. Since the fuel will be injected after both ports are closed this should result in cleaner emissions. Q: How will it run off various fuels? A: Compression ratio and timing need to be controlled. By using a variable crankshaft and a compressor/air pump both the timing and compression ratio can be controlled using an ECU (engine control unit). Q: How does a variable crankshaft work? A: The crankshaft has a series of planetary gears associated with each piston. The connecting rods are connected to a planetary gear, by rotating the ring gears the timing of the piston(s) can be accurately controlled. Q: Are there any other benefits to using a variable crankshaft? A: Since each connecting rod is attached to a planet gear their movement is linear, therefore eliminating cylinder side load. Side load is the most common cause of rod bearing failure and cylinder wear. Q: What are the disadvantages of a variable crankshaft? A: A variable crankshaft is more complex than a standard crankshaft. I would like to clarify that I don&apos;t see these motors being manufactured on the open planes of Africa as some have assumed. I see them being manufactured in shops (home, industrial, whatever) and being used in rural areas. I want to keep the design and simple as possible so when the day comes that repairs need to be made they can be done with minimal shop availability. With a 16+:1 compression ratio a compressor is not required to run diesel but would be useful for other fuels. Here are some concept renders or what the setup might look like. Here are a few images of what four motors couples together would look like. ENJOY! I have decided to move forward with a dual crankshaft configuration with static timing on the pistons in an effort to simplify the design. I have reduced the cylinder diameter to 30 mm and have increased the stroke to 33.25 mm per piston (overall stroke for both pistons is 66.5 mm). By increasing the stroke and going with a flat top piston design I have increased the static compression ratio to 23.17:1 which calculates to a 16.65:1 dynamic compression ratio from intake ports closing. The dual crankshaft design reduces part the part count for major components to eight unique major components that need to be manufactured (crankshaft, connecting rod, piston, cylinder, sleeve, cranks case, timing belt cover & backing plate, timing gearbelt pulley. Since the motor is symmetrical the same components are used on both ends of the cylinder. The upper (right side of image) crankshaft has had the extension removed to allow for a cover plate. As with my previous posts there is still a lot of engineering and analysis that need to go into this design. This is a rough model with some calculations taken into account but by no means is meant to represent a finished product. You will notice that the fuel injector port is missing, this is an example of some of the things that still need to be modeled. There is most likely some interference between the connecting rods and the sleeve. The connecting rods have not been optimized for weight, performance or clearance. A compressor could be driven by the upper crankshaft to increase cylinder pressure and help with scavenging. I would like to come up with a universal coupler for both ends of each crankshaft that would allow a symmetrical design. cogs, extensions, compressors, accessories, etc. could mate to the coupler. This would make the cylinder/crankcase assembly completely symmetrical when the timing belt and extension are not installed and would allow for joining two or more motors together with a universal adapter. The sleeve has ten intake and ten exhaust ports spaced 36 degrees. The cylinder has a runner for both the intake and exhaust that run 360 degrees. I have designed a 0.0762 mm (0.003") interference between the sleeve and the aluminum cylinder. Liquid Nitrogen Shrink fitting will be used to install the sleeve. A spring loaded belt retention will be used to assure the belt stays tight. As [tlidikay] and [Patrick] mentioned in the comments a chain drive connecting dual crankshafts might be a viable option. It would reduce reciprocating mass, reduce part count and might reduce weight while still allowing for adjustable timing on both pistons. Please feel free to share your thoughts, ideas, concerns, etc. Here are a few CAD renderings of a possible chain configuration. Here is a simplification of the crankshaft concept that I uploaded yesterday. I have removed extra ring gears that were unnecessary. This multi piece crankshaft is constructed of seven individual crank sections and three ring gears. There would only be four part numbers used for the complete assembly. By rotating the ring gear the planet gear&apos; can be rotated around the rings axis allowing the piston timing to be adjusted while the motor is running. A servo or stepper motor connected to an ECU (Engine Control Unit) could be used to automatically adjust the piston timing. This would allow the intake and exhaust ports to be open or closed for any given period of time by simultaneously adjusting the ring gear while the crankshaft revolves. We can consider it almost like infinitely variable valve timing (I know it&apos;s not infinitely but it sounds good). Dual helical gears are located on both sides of each connecting rod. There will be one right handed and one left handed helices, this balances the axial thrust in both the direction by developing opposite thrust reactions and thus balancing the axial force. It also allows for higher power transmission capacities. Compression Ratio (CR): The ratio of the cylinder volume compared to the combustion chamber volume. Static Compression Ratio (SCR): The ratio derived from the swept volume of the cylinder using the full crank stroke (BDC to TDC). Dynamic Compression Ratio (DCR): The ratio calculated using the position of the piston at intake valve closing rather than BDC of the crank stroke to determine the sweep volume of the cylinder. For now I am only going to calculate the Static Compression Ratio. With the depicted crank output, it seems you will have an issue with "stacking" the engines. Each set of engines will require a custom shaft. I&apos;d suggest a system where the housing of each engine can "nest" into the next one using "male" and "female" structures - like a socket and nut. Then, the same with the crank shafts - each end nesting into the next engine. This would allow an external binding system so that you don&apos;t need to have custom shafts created, nor long connecting bolts. I think a simple, static timing design is the way to go for the first iteration. There are other methods which might permit marginal increase in compression such as rotating the piston on a series of ramps, but again, that increases complexity dramatically. I think using external compression (blowers, turbos, etc.) might provide the adjustable compression ratio you&apos;re seeking without a lot of extra unknown complexities. Adding turbos and superchargers is "easy" and a pretty well known factor, but the internals need to work first. Speaking of "well known" - talk with a sales rep for a company such as Banks Turbo, or someone like that - they&apos;ve already got such a wide lineup of product, they&apos;re almost guaranteed to have something suitable. Allow me to introduce myself. I&apos;m Gordon, former test engineer on a 150 HP, 3 cylinder, 6 piston horizontally opposed engine that was designed for aircraft use. My group used the Jumo engine as a basis for a drone engine. It unfortunately lost favor in our company and was never flown, but we came darn close. I helped work on it for 2 years. I have some comments on your design based on my real world design/experience. 1) Ditch the electric drive scavenge pump and go with a belt/mechanically driven one. As other people have mentioned, the electric drive is very inefficient (your driving an impeller with a heavy electric motor....being powered by a battery/alternator being driven from the motor. With all your losses, it&apos;s very inefficient). Believe me, I know what I&apos;m talking about. We used a fluid driven scavenge pump to get away from the "classic" roots blower that was in previous designs. We didn&apos;t know what in the heck we were doing. After I did the efficiency calculations, we found out that our system was 1/2 as efficient as a standard roots based blower system. It wasn&apos;t even close. 2) Your inlet/outlet ports are too small. Your choking your flow. Your goal is to get a reasonable amount of the exhaust gases out of the cylinder with the roots style blower and one does this with less restrictive ports. 3) Don&apos;t neglect torsional effects. We did and we fought this for a good 6 months. Torsional effects are quite significant in this type of engine. Eventually, we put some large flywheels on the ends of both crankshafts to solve the issues. We found this out when we looked at another 3 cylinder, 6 piston horizontally opposed engine (the Coventry-Climax H-30) that was constructed for use as an APU for a British tank. The H-30 was a very nice engine (some examples exist to this day) and are known to be easily started. And they have flywheels on both cranks. We didn&apos;t originally. And we got an education on the effects of torsional resonance. Nothing teaches you torsional resonance like having your motor catch itself at a torsional RPM (I believe it was around 950 RPM) and beat itself to death. Literally. We had output shafts rated for 900 HP (safety factor of 6) snap. After putting some nice fluidic dampener flywheels on both our crankshafts, we did not have any more torsional vibration problems. 4) You will need a pressurized oil system to keep your piston pin alive. One of the problems with 2 stroke scavenged systems is that there is always a force on top of the piston. You have to have an oil film on the piston pin so that the pin doesn&apos;t die from friction rubbing. A Pressurized oil system of some type allows one to "force" oil onto the piston pin and form an oil film. That is one of the reasons for 2 stroke Diesel engine piston pins being so large. Just look at pictures of any 2 stroke Diesel engine and you&apos;ll see what I mean. You may have some leave way with this being such a small engine but that remains to be seen. These are just some observations/experiences from dealing with our motor. Just my 2c. You may want to consider making the supercharger/scavenging air pump gear or belt driven, I agree with the others, electric drive is a losing battle. On the GM two strokes, at least on the larger units, they used a gear driven turbo with an overrunning clutch once power and demand was high enough to support more airflow. Pretty slick set up. 1. The electrical supercharger - from your design i suppose it&apos;s a roots style blower - they usually are VERY expensive units (in comparison with other automotive parts) and on the other hand they require a substantial power amount. Maybe if you decide to go this route you can envision a hybrid one - electrical for starting up the engine and than driven by the crankcase. 2. You mention variable timing: considering the fact we&apos;re talking about a compression ignition engine ignition timming is actually set by the moment of fuel injection - or at least this is how it works in most diesel-style engines ever built. The variable crankshaft in a two stroke design will have little effect on ignition timing, but rather in altering compression ratios and tweaking exhaust and intake phases "moments" . Overall it seems to me that your design although a VERY interesting exercise in internal combustion engine mechanics creates more problems than it solves. Maybe you should take a look at "compression ignited" model airplane engines, with their variable compression "head" , and/or the Lohmann motorized bike engine. Great work! I would like to pass on some lessons learned from similar gear setups, and some general thoughts regarding what happens to this when you actually construct it. This knowledge comes from some work with an experimental opposing-piston infinitely variable hydraulic pump. 1. When rotating the ring gear to "adjust" your timing, what you will actually be doing is rotating the line of action that the crank pin is taking. The stroke of the crank pin remains the same, but is no longer parallel with the piston. The piston stroke itself shrinks on *both* ends in a trig relation. Since you are at the top and bottom of the cylinder, you will need a large angle to get a small difference in stroke. 2. You mentioned "quickly" rotating the ring gear to get different timing between pistons TDC (Top dead center) and BDC (Bottom dead center) in order to make one piston lead or lag the other. What is easily forgotten is that you are at the same time reacting the force of the power stroke through this gear, and will require an equal and opposite force-distance relationship to drive these rings. It is unlikely you will find a stepper that can do this, and you&apos;d use a significant amount of energy to do so. Instead, you may want to explore overlapping the pistons and offsetting them. Piston 1 gets to TDC while Piston 2 is still at 90% stroke, then as piston 1 retracts, piston 2 follows it to TDC. You can explore this concept with your current model by rotating the angle of the inner grey crank in relation to the outer crank between 15 and 30 degrees. It will require counter balance, but will give you the timing you are looking for. 1. 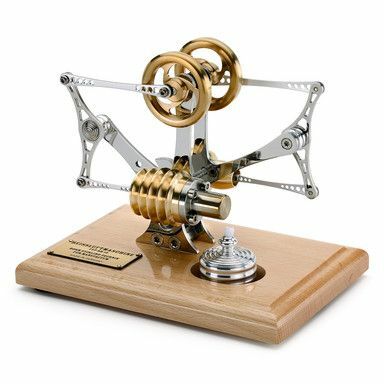 Do a google search for Stirling engines and look for the engines that have the 2 pistons in the same cylinder. Most will have the rod of the opposing piston going *through* the middle of the primary piston. This may be an option to simplify. 2. If you want to keep the "dynamic" crank setup, try making the opposing piston use a rocker arm (akin to a beefier version of a gas engine&apos;s valve rocker arm) so that you only have one crank per piston. This will help with a lot of the issues you will find in the dual-rod system. While conceptualizing ideas it is very easy to get tunnel vision and overlook obvious things. That is why it is so invaluable to have people like you look at the project. I didn&apos;t even consider that the rods would no longer be parallel to the pistons. One of the main reasons I wanted to use a planetary setup besides adjustment was to create a linear movement and reduce side loading on the cylinder. The non-parallel rods would defeat that purpose. I will spend some time exploring the overlapping and offsetting of the pistons to improve timing and will evaluate weather or not I should scrap the whole ring gear concept. Great analogy with the table, makes absolute sense and I will research Stirling engine designs and look into rocker arm options. Thanks for taking the time to do the write-up and share your knowledge, it is very helpful and much appreciated. looks very interesting! Please keep it up, would love to see the development. Have a few questions. Looks like you&apos;re intending on using an electric supercharger, rather than turbocharger or crank driven supercharger. Is this to give the effective compression ratio control you want? Or just for simplicity of implementation? Also, how is the top piston pin sealed through the side of the cylinder wall where it connects to its connecting rod? Looks like you would have to have a linear seal, or is the piston long enough that the travel doesn&apos;t extend into the combustion chamber? Would you intend on a wet sump for gear lubrication? Thereby differing from the traditional air/fuel filled crankcase/supercharge pump effect? just trying to work out the valve timing details. Still a little unsure how the variable compression ratio and crankshaft gears function. Currently it looks as though the porting would cause the inlet and exhaust ports to open at the same time (assuming both pistons displace equally) I&apos;m guessing this might be something you&apos;d like to avoid so perhaps the exhaust port would want to be taller/effectively open first, and the inlet port further down the bore/shorter to open second. This should establish flow towards the exhaust before the supercharger begins flowing in. I&apos;m also wondering whether you might want to consider a slightly different piston shape if you haven&apos;t already considered this. It looks as though this shape would suit a traditional diesel injector location and air flow type where swirl, squish and tumble are all initiated and sustained due to the piston shape. Since you have to have the injector on the side, the piston crown shape may want to be designed accordingly. Perhaps an amphitheatre type shape facing towards the injector. This shaping couldn&apos;t be too sever or it will increase your dead volume. Maybe even flat pistons would be fine, or slight bowling without the centre bowl. The idea behind an electric drive compressor was that it would allow for 100% tunability at any RPM. Simplicity and ease of implementation would be another plus though. Originally I wanted to connect the rods directly to the top piston pin. You hit it right on the head, the slots in the side of the cylinder would extend too far into the chamber unless the piston was extremely long. If you look at the third picture in the gallery you can see a "T" shaped rod connected to the top piston, the rods from the crank connect to that which allows for shorter slots in the cylinder. A wet sump lubrication system is currently the idea I am going to run with unless something easier presents itself. By rotating the ring gear while the crank shaft is rotating it should be possible to pause, advance or retard the timing. If the ring gear on the exhaust piston is rotated during compression the exhaust ports could be held open for any given period of time. Combine that with an electric compressor and the exhaust gases can be forced out of the cylinder. By quickly rotating the ring gear in the opposite direction and stopping it at a given point the exhaust piston timing can "catch up" to the position of the intake piston. It&apos;s the same principal for the intake piston. I have uploaded a few new image of the complete variable crankshaft concept. The whole mechanism might get scrapped for version 1.0 of the motor in favor of simplicity. A static crankshaft would be a lot easier to design than a dynamic one. You are absolutely correct, this piston design is not a good one for this configuration and it is for visual purposes only. The end goal is to design a piston for maximum flow/swirl. I am still in the infant stage of conceptualization so I truly appreciate any and all input. Your knowledge of engines is impressive, do you work with engines as a hobby or a profession? Thanks for the feedback, feel free to throw out any thing else you can think of (it helps a lot). Umm I cant see any kind of scavenge pump on there? Please keep in mind that this is a simple model to show the design intent. The project is still in the conceptulization phase and any input or suggestions is greatly appreciated. I get your point. I am very interested in these engines too! Apparently Napier built a large two stroke diesel engine that had a turbine driven by the exhaust which was connected to the crank by a gearbox, therefore harvesting kinetic energy from the exhaust and feeding it back to the crank. Apparently they were very efficient but horrifically complex and expensive to produce! I wish you luck! Placing a second crank on the other side for the second piston will negate any weight saving you do by using a chain. This probably is the lightest solution and allows for easy variable crankshaft, which would be much more difficult to do if there were 2 crankshafts. I am a bit worried about tolerances and harmonic issues that we might have in the crank. You&apos;re not the only one worried about tolerances and harmonic issues! Can squeeze a little more efficiency out of it by moving from a solid bar to connect the two pistons to a chain (reducing the mass of the reciprocating parts) This of course would require a redesign in that the planetary gear and crank for the second piston would need to be moved over to the other side, and the chain only used to reference the two pistons to each other. I had thought about using a chain to connect two crankshafts but I worry that it would be a weak link (no pun intended) in the design. I could most likely use the same planetary setup on both ends. Thanks for the info Patrick, I will definitely be looking into inverted tooth chains. Interesting design. I hope it actually be constructed. a very low fuel consuming Ion engine designed for use on a pocketqube standard sattelite. You are about to report the project "Open Source Two-Stroke Diesel Engine", please tell us the reason.